This seems like an appropriate addendum to my article last week on staying positive in the age of Rage on the internet. Shortly after publishing that article a new Podcast went live, The Mortal Realms, the first podcast (as far as I'm aware) created solely to discuss Age of Sigmar. Now there are plenty of podcasts out there that focus on the Age of Sigmar (AoS), even a few I mentioned last week like Garagehammer and Heelanhammer. The difference is that those podcasts were created during 7th or 8th edition of Warhammer Fantasy and have transitioned into covering AoS with the game change. They are doing a fantastic job at it too, but The Mortal Realms is the first podcast to be created after the launch of AoS. This means it was created specifically for AoS and because its creators liked AoS so much that they wanted to bring a podcast out dedicated to only that. Like I said, this is so brand new that they only have one episode out. The podcast is run by Eric, Davy, and Mal, and they all bring their enthusiasm of the game to the cast. Episode one is meant to be more of a primer for people to familiarize themselves with AoS. They hit all of the basics you would expect such as an introduction, community news and releases, and then move on to the story. In this first episode they go over the basic story we know so far from the first big book. They each take a turn discussing one of the Ages, the Age of Myth, the Age of Chaos, and of course, the Age of Sigmar. This felt a little dry at times, and came across like they were reading straight out of a book. Mal did the best on this in my opinion with his coverage of the Age of Sigmar. He had more of a conversational tone and plenty of add lib which just felt more natural to me. It felt more like someone discussing the story instead of someone reading off of a cue card. As they moved on to the other sections of the podcast the other's tone shifted more to conversational back and forth, which is good. I just chock the earlier stiffness up to growing pains and familiarizing themselves with doing this podcast. Despite this it was pretty informative without giving away the whole story. If you haven't read the big book yet it's a nice place to catch a quick recap of it. In the future I am assuming they will be covering whatever new lore comes out, and at this point there is plenty to cover with The Quest for Ghal Maraz out as well as two novels and a Battletome with more imminent. The next section was called the Hero Phase where they discussed how best to get started in the hobby and help expand the community. They mostly talked about some good practices for people starting out as well as a few different websites and such that provide some good AoS content. I will be interested to see what they do with this section in the future since it seems like it could run the risk of repeating content eventually. At the same time it is really nice that they are giving shout outs to others in the community and helping spread the love. They also went over what projects and armies they are working on and why they picked them. The last two sections were the Hobby Phase and the Campaign Phase. The Hobby Phase is pretty self explanatory and they go over all of the resources out there for people looking to start painting as well as other options such as commission painting services. Since this is the first episode there was a lot of talking about what is out there for new listeners and such, so I am interested to see where they go in the future. Obvious choices are talking about their current hobby projects or other cool new things that have cropped up in the internet. I am clearly a fan of hobby so I will be keeping an eye on it. The Campaign Phase is where they will go over tactics, rules, and I'm assuming in the future, possible detailed coverage of games played. In this first episode they mostly talk about the misconceptions out there about the level of tactics and skill needed to play AoS. For a first episode of a podcast The Mortal Realms is very promising. There are some areas I wouldn't mind seeing improve or change a bit. Like I mentioned before there were a few sections that seemed a little too stiff and I think it could benefit from a little more natural conversation and a little less structure. I am sure this is something that will come with time though and I'm really just nitpicking at this point. Overall I really enjoyed it and I'm just excited to see AoS exclusive content start to pop up around the web. 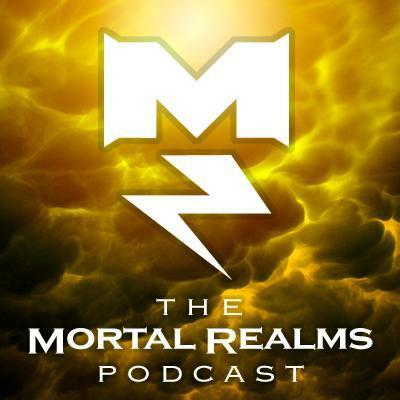 I will definitely be adding The Mortal Realms into my podcast rotation alongside my usual batch to see where it goes from here and recommend giving it a listen to anyone who might be intrigued. Episode one is a little over an hour long, so it's not a huge time commitment. I'm not going to give this a score like I normally do in reviews since it is SO new and podcasts are something that need to grow and find their flow and niche with time. Instead I will just say that it was a good first episode and I see a lot of potential and promise with it going forward.